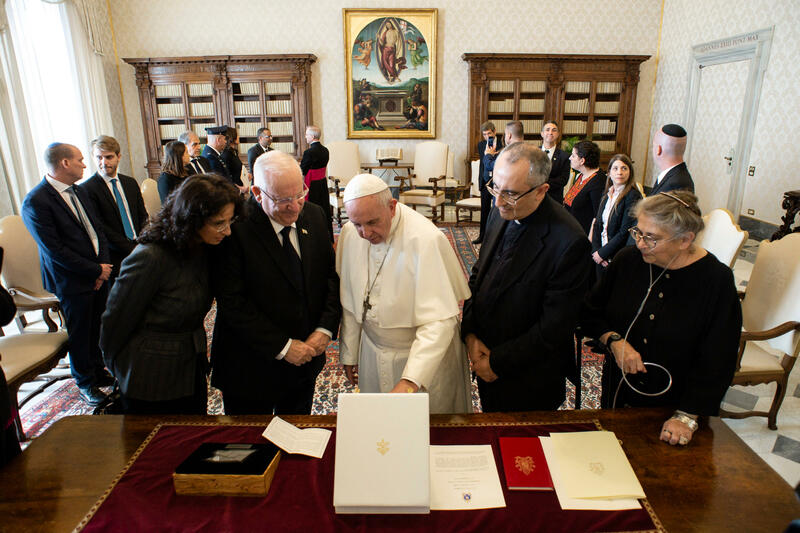 Pope Francis received President of Israel, Reuven Rivlin, in the Vatican today Thursday, November 15, 2018, according to a statement of the Holy See Press Office. According to the Vatican, their discussions–which took place around the twenty-fifth anniversary of the establishment of diplomatic relations–were cordial, and highlighted the positive relations between the Holy See and State of Israel. After meeting the Pope, the Israeli President met with Vatican Secretary of State, Cardinal Pietro Parolin, and the Vatican’s Secretary for Relations with States, Archbishop Paul Richard Gallagher. This encounter marked the Israeli President’s second visit to Rome and to the Vatican. His first visit was in September 2015. President Rivlin also met with his Italian counterpart, President Sergio Mattarella, and Prime Minister Giuseppe Conte. During the Sept. 3, 2015 audience, the Pope and the President stressed the “urgent need” to re-launch the dialogue between Israelis and Palestinians. President Rivlin then too met with Cardinal Parolin and Archbishop Gallagher. Born on September 9, 1939 in Jerusalem, Reuven Rivlin has been President of the State of Israel since July 24, 2014. A lawyer by formation, he began his political career in the 70s and entered Parliament, the Knesset for the first time in 1988, under the colors of the Likoud party — a nationalist party of the right. Minister of Communications between 2001 and 2003, he was elected that same year President of the Knesset. A candidate during the presidential election of 2007, he was beaten by Shimon Peres on the first round and withdrew his candidacy. Two years later, in 2009, he became President of the Knesset for the second time. Despite the tensions with the Prime Minster and leader of the Likoud party, Benyamin Netanyahou, he was again designated a candidate for the presidency of the State of Israel and was elected in 2014. He will return to Israel on Saturday, November 17.